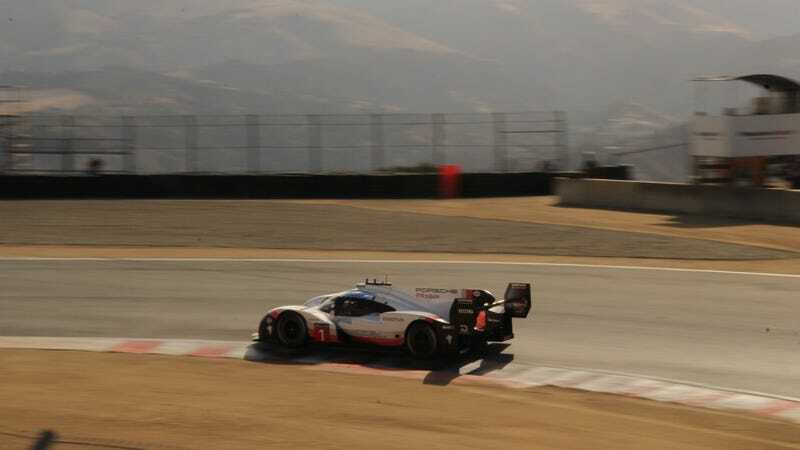 Porsche has been teasing us for three days by running the 919 Hybrid Evo at Laguna Seca for the Rennsport Reunion festivities. For three days they’ve run within seconds of the track record, seeing times as low as the 1:07 range, while Ferrari’s F2003-GA record is mouth-wateringly close at just 1:05.786. When I arrived at Laguna Seca and saw the stacks of tires with warming blankets wrapped around them, plus a full crew of engineers, it was pretty obvious that Porsche would be putting in a serious attempt for the track record. The final day of Rennsport is upon us, and the last session for the 919's so-called Exhibition Laps has come and gone without a new record. Call me a conspiracy theorist if you like, but I think they’re going to stick around through Monday to set a fast time when they have the whole track to themselves. Watch this space for more as it becomes available.